We use a variety of tools to understand student achievement and look closely at our results. In keeping with our focus on results and our commitment to transparency, we are pleased to share the 2018 WLHS Report Card, 2018 State Accountability Report Card, and our most recent school accreditation status in the following update. SAT: WLHS college-bound students who took the SAT exam averaged a 1269 (88th percentile). Achieving a 1269 means a student scored better than 88 percent of all test takers. ACT: One hundred percent of WLHS seniors completed the ACT exam during their junior year. The top 75 percent of seniors averaged 23.1 (70th percentile) on the exam. Achieving a 23 means a student scored in the top third of all students nationwide. WLHS’ all-student composite score was 20.8, outpacing the averages for the state (20.1) and Milwaukee district (16.2). Advanced Placement Exams: Eighty-one percent of students who took AP exams received qualifying scores for college credit. 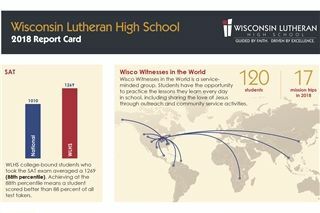 Wisco Witnesses in the World: Students have the opportunity to practice the lessons they learn every day in school, including sharing the love of Jesus through outreach and community service activities. A record-breaking 120 students participated in mission trips in 17 communities around the world during the school year. Baptisms: Thirteen students requested to be baptized at a special chapel service. Please take a few minutes to review the entire WLHS Report Card by clicking on this link. The state also issues an accountability report card, and Wisconsin Lutheran voluntarily participates in an all-school evaluation. WLHS earned ratings of “Exceeds Expectations” on the State Accountability Report Cards issued by the Wisconsin Department of Public Instruction for the 2017-18 school year. To review the state’s all-student report for WLHS, click here. The state’s choice-only student report can be viewed here. To view a list of educational options in the state, visit https://dpi.wi.gov/ed-options. Wisconsin Lutheran reached the highest level of accreditation status from three accrediting agencies. Accreditation is the recognition from an accrediting agency that an institution meets or exceeds nearly 300 standards of quality. WLHS voluntarily participates in this rigorous process as an additional accountability measure to ensure the school fulfills its mission and maintains the highest levels of quality.